Although RentalDesk NX is primarily used as a rental management application, many of our users are in fact manufacturers or distributors and they use RentalDesk NX to track and schedule their demonstration stock. One of the specific features of RentalDesk NX that makes this easier is the Find Available Dates function. With a regular hire, the customer calls up, tells the supplier the dates of their show and what equipment they’d like. The supplier then looks to see if this equipment is available, if it is, then the rental can go ahead, but if it’s not then the supplier will either arrange to sub-hire in the equipment from someone else or will offer the customer some alternative equipment. With demonstration stock the requirement is different. The customer will tell the supplier what equipment they want – often it’s simply a loan so that the customer can test that the equipment meets their requirements before placing an order to purchase. If the demonstration equipment isn’t available immediately, then the customer will happily wait until it is. This is where RentalDesk NX’s Find available dates function comes in to play. Once the user has created an equipment list and seen that there is an availability problem, they can simply click on the Find available dates menu and see what dates all the equipment is available. They can then offer the equipment to the customer based on these dates, which maximises utilization by making sure that the minimum amount of stock is designated “demonstration stock” rather than regular sales stock. 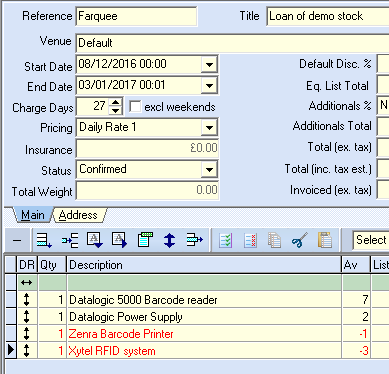 Here the customer wants to borrow some demonstration equipment for 4 weeks, but the Barcode Printer and the RFID system are already on loan to someone else. The user could drill down through the availability popup to see why the equipment is available, but this is limited to conflicts that interact with the current list dates, it won’t display when the equipment might be available in the future and is limited to just looking at one line of the equipment list at a time. 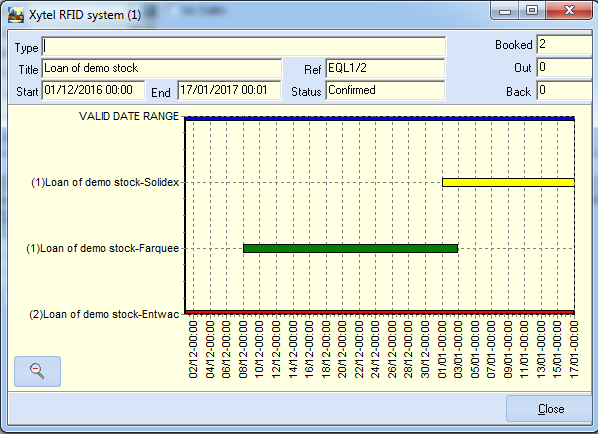 The system looks at all the equipment required by the customer and finds which dates the equipment is available for the required 4 week period. 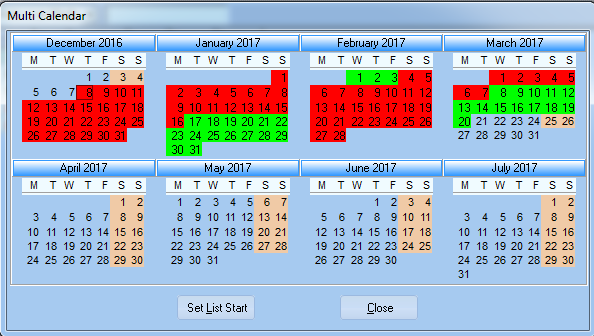 So we can happily offer all of the equipment to the customer on any of the dates shown in green, knowing that we have clear availability.